Hermanus is built on Walker Bay and flanked by the ocean and the Kleinrivier Mountain Range. These natural wonders are humbling in their proportions and fascinating to explore; offering visitors a completely different world of biodiversity and breath-taking backdrops to their Cape Overberg adventure. There are many remnants of the indigenous folk that once occupied this gorgeous area tens of thousands of years ago. A number of caves testify to having been shelter to groups of Khoisan for at least some time. Shipwrecks brought some sailors and explorers to this part of the South African coast. Soon, escaped slaves, missionaries and other explorers began to settle in this scenic wonderland. Over the years, it gained acclaim for its excellent fishing, luring fishermen from further afield to establish a small fishing village. This was the humble origin of Hermanus. Today, the beaches are inviting for water sports. Grotto, Onrus, Sandbaai and Kammabaai beaches each offer something a little different. Grotto Beach has Blue Flag status, which means that it meets all of the international criteria for an outstanding beach. It is vast and sandy, with plenty of place for visitors to sunbathe and play. Swimmers need to be aware of the potentially strong tides. 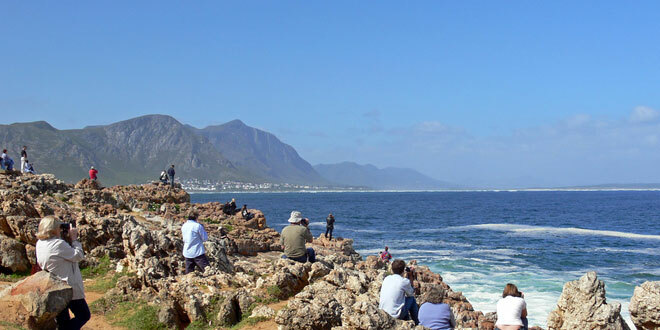 Of course, Hermanus’ “place on the map” has been firmly set in stone by the whale watching tours and opportunities here. The Whale Crier of Hermanus is world famous as the only whale crier on the planet, and blows his horn eagerly when whales can be spotted in the waters just off the coast. The most commonly seen species are the southern rights, humpbacks and orcas. They breach, lobtail. and spyhop curiously as spectators appreciate their antics from the shore or from whale watching boats that can get a bit closer to these mammoth mammals. The surrounding mountains and rolling landscapes offer stunning trails to hike, walk, cycle and run. These include the trails in the Fernkloof Reserve, the Hermanus cliff path (of which parts are wheelchair-friendly), Salmonsdam Mountain Trail, Salmonsdam Ravine Trail and Salmonsdam Waterfall Trail. The Fernkloof Nature Reserve occupies the mountain range that overlooks Hermanus and is a hotspot for gorgeous fynbos and beautiful forests. In fact, this reserve is renowned for having the most variety in such close proximity in the world. Animals like baboons, mongooses, Cape grysboks porcupines, and grey rheboks can sometimes be seen. Fernkloof also has a wonderful array of bird species, with 92 identified species calling this home.